FREE FRUIT TREE PRUNING CLINICS THIS SATURDAY AND SUNDAY 10AM. TWO MORE NEXT WEEKEND. THE FIRST OF FOUR FRUIT TREE PRUNING CLINICS WILL BE THIS SATURDAY JANUARY 19TH AT 10 AM IN THE NURSERY ORCHARD. LOOKS LIKE NO RAIN SATURDAY. SECOND ONE IS SUNDAY THE 20TH AT 10 AM. IF IT IS RAINING, WE WILL RESCHEDULE. ALSO NEXT SATURDAY AND SUNDAY THE 26TH AND 27TH AT 10 AM EACH DAY. FOUR CHANCES TO ATTEND THE PRUNING CLINICS. SHOULD BE ABLE TO WORK INTO ALL SCHEDULES. CLINICS ARE ALL THE SAME, SO PICK ONE THAT FITS YOUR SCHEDULE, OR ATTEND MORE THAN ONE. LEARN HOW TO PRUNE YOUR FRUIT TREES. WE WILL COVER PEACHES, NECTARINES, PEARS, PLUOTS, APPLES, PLUMS, APRICOTS, CHERRIES. WE WILL HOLD THE CLASSES IN OUR ORCHARD HERE AT THE NURSERY SO PLEASE DRESS ACCORDINGLY. DRESS FOR DAMP GROUND AND COOL WEATHER. FREE COFFEE, TEA, AND HOT CHOCOLATE DURING THE CLINICS AND THROUGHOUT BARE ROOT SEASON. We will also cover rose pruning, dormant spraying, and planting bare root trees and answer any questions you may have. Bare Root season continues through the end of February. 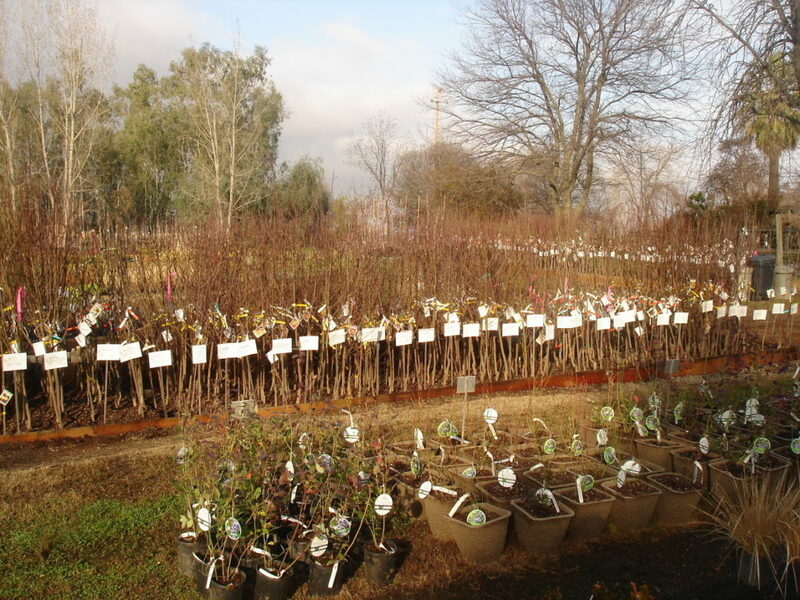 Great selection of bare root fruit trees and roses and shade trees. Blueberries, Raspberries, Blackberries, all available now as well and onion starter plants. And of course our full line of shrubs, trees, and plants.